Light: Holding your own in extreme circumstances. Helping others carry their burdens. Coming to the aid of the oppressed. Knowing and being honest about your own limits. Recognizing when you are not well-suited for a particular task. Shadow: Taking on more work than you know you can handle. Refusing to say “No” when you’re already overloaded. Making a habit of working overtime. Shielding others from facing the consequences of their own poor judgment. Over-extending yourself on a regular basis. Story: The Main Character attempts a task he is not well-suited for, with disastrous results. Relationships. Some relationships become a burden. When this happens, have the presence of mind to put them aside. Relationships involve more than one person. When you’ve done all you can do to make a relationship a success, there’s no shame in withdrawing from a bad situation. Work. Over-extending yourself on a regular basis is not a sign of strength: it’s evidence of poor judgment. You cannot perform at your best when exhausted. There are too many irons in the fire. Review your values and make tough choices, letting go of work that isn’t critical. Spirituality. When we are exhausted, we tend to feel disconnected from Spirit. Restore yourself (and your spirit) by scheduling regular quiet time. Guard this appointment with contemplative silence as jealously as you would an appointment with a life-saving doctor. Disconnect—and reconnect. Personal Growth. Knowing your own limits is a sign of maturity. Don’t take on more than you can reliably handle. It’s better to be respected for saying “No” than hated for saying “Yes” and failing to deliver. When unreasonable demands are made, point them out and sidestep them. Fortune Telling. You’re worn out! Back off, take a time out, and let someone else handle things for a while. When? Between December 13th and 21st. The Stooped Figure. 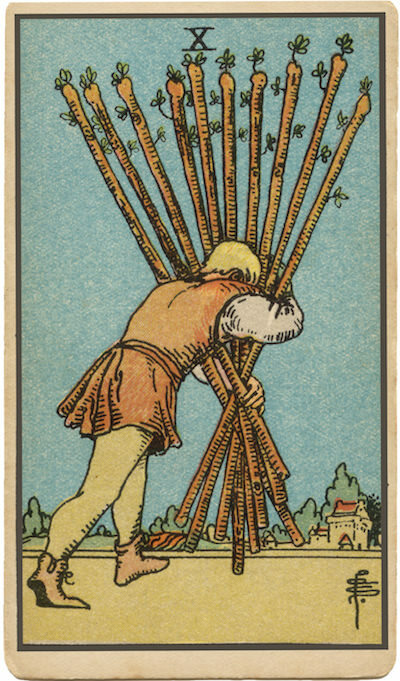 Most RWS-inspired decks depict a stooped, overburdened figure on this card. He has gone as far as sheer Will can take him; he is on the verge of collapse. There comes a point when too much is too much, and it’s time to re-evaluate your approach to the problem. The Distant Village. Some RWS-inspired decks depict a distant village in the background of the card. The village is the light at the end of the tunnel: a reminded that the destination is close at hand. Your own “way out” may be as simple as declining an opportunity you lack the time or energy to complete. Exhaustion. Fullness has been exceeded, and the energy of the Wands suit becomes spoiled and over-extended. As a result, we’ve become slaves to our own intentions; a little searching, though, will help us find the key to escaping our self-made prisons. The Marseilles Image. Though woven tightly together, the ten Wands seen here are as compressed as they can be. Adding another would likely cause an explosion! Intent and action have reached their limit; it’s time to try another way of solving the problem at hand. How will you know when you reach the end of your rope? How easily do you say no to new projects and requests? What projects could you delegate…or eliminate?